This week is spring break. The kids are home from school all week, and the Hubs isn't traveling this week. So, I am planning for family dinners that hopefully everyone will enjoy. Monday - Pork brasciole that the Hubs picked up from our local butcher. Wednesday - Chicken stir fry with brown rice. Friday - Potato galette (I've been itching to make this recipe for a long time.) with a side salad. Saturday - My great nephew's first birthday party. Menu planning doesn't have to be a chore! 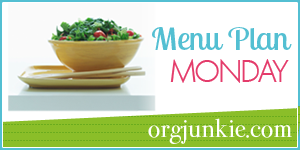 For inspiration and to see what others are eating this week, visit I'm an Organizing Junkie's Menu Plan Monday. To see all of my menu plans, click here.